I have been away from Adventist Voice for awhile because of internal conflicts about the Adventist organization. I grew up Adventist, going to Adventist schools and marrying an Adventist girl. After attending and assisting with an evangelistic meeting in 2000, I got serious about God and went off to Union College to study Theology. My first pastoral district was in the Dakota Conference and later in the Pennsylvania Conference. I tried to enjoy pastoral work, but was constantly dreaming of something more and better for the churches I worked with. The Bible and Spirit of Prophecy are great resources for pastors if the church members are passionate about Jesus and His mission. If the church members are content with maintaining the status quo, the Bible and Spirit of Prophecy can be torturous. Let me explain myself… The reason I was interested in ministry was because of what I read in the Bible and Spirit of Prophecy. I learned about what healthy Christians and churches should be doing in these final days and wanted to help lead others in the mission to seek and to save others for the eternal kingdom. After investing many days and dollars into my Adventist education and securing my first district, I learned that church and conference leaders (in the USA) are not interested in what the Bible and Spirit of Prophecy says about our evangelist mission. They are interested in maintaining the status quo and playing politics. I have sat through many conference meetings where I heard conference leaders say good things about mission, but nothing was restructured to achieve missional success. This can be torturous to the pastor who is passionate about expanding God’s kingdom here and now. It is like having the medication needed to help someone who is very sick, but that person will not take it because it is not how they have done it in the past. The dying person chooses to remain sick instead of taking the medication needed for healing and healthy living. This is where the Seventh-day Adventist Church is right now. We are sick and God has already prescribed the medication needed to heal us, but our CONFERENCE and church leaders refuse to take it and use it. I will continue to cover this subject in the weeks and months to come. I have considered seeking other church options, but there is no where to go. God’s end-time Church needs to stop playing around with our God-given missional calling and get serious about seeking and saving the lost. What will it take for our spiritual leaders to wake up before it is too late? Been a long time since we have heard from you. We can certainly sympathize with you over your frustration about the SDA organization. 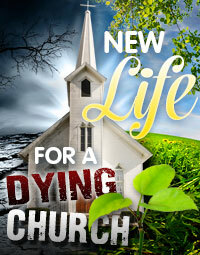 We also have been SDA all of our lives, and have seen things change and deteriorate over the years. It is in so many areas, not just missional, but that as well. And you hit the nail on the head when you said that the answer lies in the study of the Bible and Spirit of Prophecy! The compromises that are occurring are so sad! God didn’t miss one thing and all we have to do is avail ourselves of the information that He has given! Thanks for the encouraging words. I know we have so much potential as a Church, we just need to pray for and act on the guidance God has blessed us with. My wife, Sally, and I recently moved from Michigan to Milo, Maine. The church in Milo consists mostly of methodists and baptists. I have yet to speak with people here about their personal spiritual journeys except for our landlord, Bob Brooks. His father “joined” the Roman Church in order to marry his mother. After Bob graduated from high school, he enrolled in a seminary but his father told him he didn’t want him to pursue that vocation. He very much admired his father so he took his advice and got degrees in engineering instead. Bob’s father died when Bob was 20. Bob got married and had two girls. While one of them was still in diapers, his wife died. He raised the girls by himself. They are now grown. Bob has remarried and describes his new wife as “a wonderful Christian.” Please pray that Sally and I will be given the wisdom to encourage Bob and his wife in whatever ways we can. I realize that your post is intended primarily for Seventh-day Adventists but I have a suggestion that might be helpful. The phrase, “the Bible and the Spirit of Prophecy” makes no sense to most Christians because the Bible IS the spirit of prophecy. I think we should expect special revelation in these latter days but that phrase creates an unnecessary barrier to dialog between Seventh-day Adventists and other Christians. When you meet people who aren’t Christians, what is the first doctrine that you typically encourage them to consider? When you meet people who consider themselves Christians but who who aren’t protestants, what is the first doctrine you typically encourage them to consider? When you meet people who consider themselves protestants but aren’t adventists, what is the first doctrine you typically encourage them to consider? I go to Cebu every now and then and I always book the 3PM outbound flight because they use the 747. I hope they use the refurbished and rerocfiguned 747 one of these days and I hope to be on that flight.